Air101: The grovelling memo from Ryanair getting short shrift from pilots. The grovelling memo from Ryanair getting short shrift from pilots. 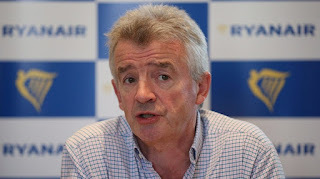 Earlier this week the boss of Ryanair, Michael O'Leary, sent a mega long letter to the pilots he thinks are just glorified taxi drivers, whose job he belittles as not very difficult at every opportunity, to get them to stay with the airline. The letter offers the flyers better pay and conditions, or at least some of them, for the pay rises only effect a rather small percentage of pilots and doesn't apply to all bases. In the letter, O'Leary also apologises for a multitude of short notices changes and disruptions to their rotas and pleads with them not to leave the airline. The grovelling letter promises pay increases, loyalty bonus payments, improved rotas and better compensation for some pilots forced to work away from their home base, although none of which has been accurately costed - a point raised by many, including The Irish Air Line Pilots Association. There is also concern that this is just another example of Ryanair promising all sorts of benefits, but not actually delivering, "Our members have experienced Ryanair promises before and therefore we will need to carefully consider each point before we decide on a response," said the association. In the letter O'Leary mentions that Ryanair pilots are the best in the business, which comes just days after he said they were "full of their own self-importance" and "It's not a very difficult job"
The O'Leary memo stressed that Ryanair was is a "very secure employer' - in a very insecure industry" he also urged crews not to depart for join "one of these less financially secure or Brexit-challenged airlines". Adding, "the recent bankruptcies of Air Berlin, Alitalia and Monarch", as well as the difficulties faced by another budget airline, Norwegian Air, which has been under pressure to boost its finances. Many pilots are equally dismissive of O'Leary's words, "It's the standard. It's a, How nice we are, followed by a carrot and then a threat." said one captain to the BBC. "It is too little, too late and doesn't apply to all flight crew," another Ryanair flight crew member told us via email. "The trust between employee and employer has been at a low ebb for some time now, nothing has changed following that memo." a Stanstead based pilot said. "It was quite a landmark memo, we feel like he's brought it out because of this crisis," the pilot said. "He's realised actually that he's upset a lot of his pilots...I can see if they don't make a serious change, then yes, I can see cancellations carrying on next year." said one Ryanair pilot in an interview with ITV news. He's not alone, a number of industry insiders have speculated that the current wave of cancellations will continue, albeit, at a slightly lower rate, well into the next summer season.